You've just read an outstanding investment report on a foreign company. Everything about the recommendation sounds great – the story, the fundamentals, the timing. But then you try to buy the stock… and find it's "unavailable." It can't be purchased. You have to abandon a great opportunity simply because your brokerage firm can't – or won't – purchase individual foreign stocks. The fact is, you never have to pass up a great opportunity, as long as you know where to go. And we're about to show you. For far too long, the theme for U.S.-based investors has been "so many stocks – so little access." Data from the World Federation of Exchanges shows that the number of companies traded around the world is approaching 50,000, while the number traded in the U.S. is less than 5,000… and shrinking. Globally, stock markets are still seeing the number of listings rise. 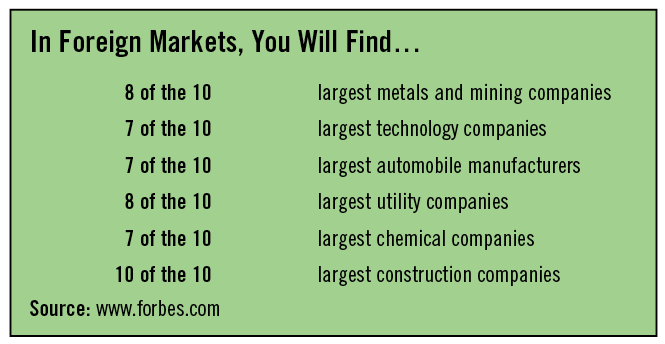 But U.S. listings now account for only about 10% of all listed companies. That's significantly lower than America's share of global GDP, which is closer to 20%. At the very least, the U.S. is transitioning from many public companies to more private companies, while the rest of the world is moving in the opposite direction – and fast. Anybody with the majority of their equity holdings in U.S. companies is missing out on an important shift. Yes, many U.S. companies are active globally, and those U.S. listings do include a smattering of foreign companies, in the form of ADRs (American Depositary Receipts). But it's a big world out there, and if you're looking to tap into global growth, it's going to be hard to find it if you confine your search to the U.S.
With so much growth occurring, U.S. investors wanting to expand their reach may find it hard to execute trades through their current myopically inclined trading desks. Ameritrade, Scottrade, and the assorted other online discount brokers won't be able to get it done. But we're here to show you that's not a problem. You just have to be willing to expand your brokerage horizons. Unfortunately, U.S.-based investors who shortchange their international exposure not only miss out on the majority of worldwide equity investments, but they miss out on the best-performing equities as well. For those willing to take the simple action of opening a new (or second) brokerage account with a firm that can access foreign markets, the future Apples, Microsofts, and Intels are waiting to be discovered all over again. Not only in China, but also in Hong Kong, Singapore, Europe, South America… the list goes on and on. The reality is, the U.S. markets have been soundly beaten by nearly every major foreign exchange for much of the past decade. In fact, the U.S. has not been the top-performing developed stock market in any of the last 10 years. When you look at the bigger picture and take into account all global benchmark stock-market indexes, the picture is even worse for the U.S.-only investor. 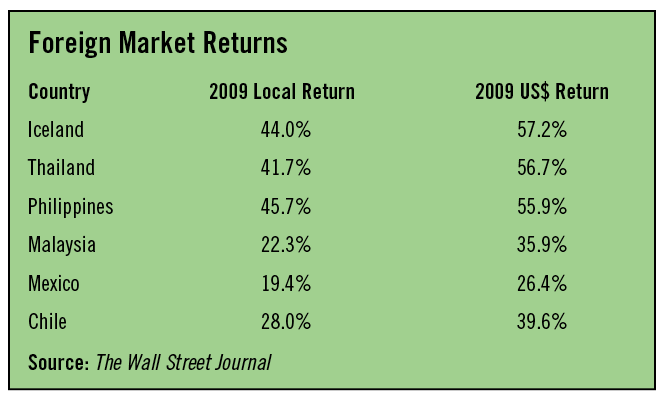 According to The Wall Street Journal's Year-End Review of Markets for 2010, U.S. market returns don't even rank in the top 10! In fact, the Dow Jones Industrial Average was only the 15th best-performing market in 2010, trailing the likes of exchanges in Argentina, Chile, Indonesia, and even Iceland. The story was worse in 2009, when the U.S. couldn't even crack the top 30 Global Indexes, coming in at lowly No. 31. And here's the thing: That year's top market (Indonesia) beat the U.S. performance by more than five-fold. The year before, when markets worldwide imploded in 2008, our domestic markets were no different. They failed to provide investors any kind of safe harbor. U.S. indexes made the top 30 only by the skin of their teeth in 2008, clocking in at No. 29 on the global hit parade. Unfortunately, most U.S.-based investors have been content with these sub-par gains. Few have been participating in this global windfall. Now that can all change. While we have grown accustomed to many aspects of globalization, there's one area many Americans still steer clear of – investing internationally. According to the Employee Benefit Research Institute, the average employee who participates in the nation's 1,000 largest company retirement funds (401(k)s, for example) places only about 1% of his or her portfolio in foreign equities. And, as you can see from the above data, that has clearly been to their detriment. Why so many investors are unwilling to benefit from the world-class opportunities that international investing offers remains one of life's unsolved mysteries. But there's no reason for the educated investor to leave some of the world's best-performing stocks on the table. In fact, we'll show you how to easily grab them. As you can see in this chart, more than half of the world's market capitalization lies outside the Western Hemisphere… and the trend is accelerating. Many international economies are currently growing at a faster rate than the U.S. economy, so investing abroad offers you greater growth potential – and helps offset any weakness in the U.S. portion of your portfolio. In fact, the correlation between international and U.S. stocks is starting to decline, as foreign stocks are increasingly starting to dance to their own tune. This diversification may help reduce risk and smooth out the ups and downs of a portfolio's overall returns. Additionally, by expanding your investment horizons to include foreign markets that are considered "developing" or "emerging" (such as Brazil, India, or China), you can discover attractive companies that have not yet been fully valued by the market. And finding a "diamond in the rough" opportunity in one of those markets is far more likely than discovering one on Main Street. Many non-U.S. companies make products that are very familiar. Think of all the Bayer aspirin you've popped over the years (from a company based in Germany). Maybe you've been driving around town in your Toyota Prius (from Japan) or Kia Sedona (from Korea). If you're one of the many iPhone users, you should know it was made in China. If you're using a different smart phone, it was probably made by Nokia (in Finland) or Samsung (in Japan). Many of those handheld video games your kids can't put down have a Sony trademark on them (another Japanese company). If you still need convincing, walk into your closet and start reading your clothing labels. Almost all your shirts and slacks will say "Made in China." In fact, you'll be hard-pressed to find one tag that says "Made in the USA." You use all these products without giving it a second thought. Although U.S. stocks appear to have appreciated in lock step with foreign stocks, when currency changes are factored in, the gains in U.S. markets are, in fact, diluted. Over the last six years, the U.S. dollar has declined by more than 36% when measured against a basket of foreign currencies. Wall Street and Washington have tried to convince Americans that dollar declines don't matter. For the most part, they have succeeded. But wise investors can see through this self-serving rhetoric to understand that, in the global economy, currency prices are an integral part of real returns. Today, strong global growth is a major force pushing the price of oil and the value of the dollar in opposite directions. A sliding dollar gives oil exporters an incentive to keep prices high to avoid eroding their own purchasing power. But this creates a dilemma: Oil-producing countries and emerging economies like China find themselves sitting on mountains of dollar reserves that are losing value. Unfortunately for the U.S. dollar, this spells trouble, as these countries make a logical decision to put more of their oil and export earnings into the euro and other currencies. In fact, this trend has been unfolding for some time. In April 2008, the value of a dollar fell against all of the 16 most actively traded currencies – and ended at its lowest point ever against the euro. Federal Reserve Chairman Ben Bernanke recently warned Congress and the White House to refrain from big spending cuts or tax hikes in the near term, because the economy is still "fragile." But economists predict the government will run up a deficit of around $1.3 trillion this budget year. That would mark the third year in a row of one-trillion-dollar-plus deficits. This debasement of the dollar will further erode the value of the greenback versus foreign currencies. And the fact is, the constantly shrinking dollar is a real drag on a U.S.-only investment portfolio. As you lose purchasing power, foreign investors gain it, and their appreciating currency "super sizes" investment returns when converted to dollars. As you can see from this table, last year, an Icelandic investor saw an additional 13.2% gain when his return is converted to dollars. A Chilean investor chalked up a 11.6% bonus. A Philippino added an additional 8.2%. And investors in Thailand sported an impressive 15% addition. In other words, these investors made an additional 13.2%, 11.6%, 8.2%, and 15% on their money… simply by having their investments denominated outside of the dollar. And it doesn't help that a Chinese officials continue to indicate that Beijing plans to further diversify out of the dollar. (China's foreign currency reserves – now above U.S. $2.8 trillion – are the largest in the world). At the very least, global investors can achieve diversification and much-needed protection from future U.S. weakness. You don't have to invest in every foreign market – but by casting your net a little wider, you'll dramatically improve your chances of catching the best fish. A good example is what has happened in the initial public offering (IPO) market. The Asian market accounted for 64% of total IPO funds raised in 2010. That's up from a mere 12% of the market the region held in 1999. Noted investor Jim Rogers thinks that the China "story" is still in the early stages and that the opportunities he discusses in his book will last a century. You need to prepare yourself for the many opportunities that will present themselves in the months ahead. Setting up a brokerage account with a company that can purchase foreign stocks will put you in position to jump on top-notch stocks around the world. Allow us to let you in on the powerful "secret" to successfully trading foreign stocks: It's all about the broker! One with direct foreign market access can make a world of difference. Investors Warren Buffett, John Templeton, and Jim Rogers – like thousands of other successful wealth builders – understand that investing in stocks outside the U.S. can help preserve and enhance your wealth. Benefit from any currency appreciation of the host country. Capture powerful opportunities in emerging markets. As for single stocks, the only foreign shares that most U.S. investment advisors and brokers will recommend are the relatively few foreign stocks listed on American exchanges as ADRs (American Depositary Receipts). Again, these tend to be only the largest multinationals, which generally have the highest correlation to U.S. markets. Remember, real protection against a dollar meltdown and a slowing domestic economy will require much more exposure to non-dollar assets then most American investors currently have. Ask your local broker or financial advisor about buying stocks on foreign exchanges, and there's a good chance you'll immediately hear a rash of warnings about loose financial controls, political turmoil, economic uncertainty, and currency risks, all part of a laundry list of reasons to avoid those securities. Despite the misinformation that some advisors put forth discrediting foreign securities regulations, many of the best-performing foreign exchanges, like Singapore, Thailand, South Korea, Australia, etc. are characterized by first-class accounting standards, rigorous transparency, and histories of strong governance and oversight. In the wake of scandal after scandal, can the same be said about the NYSE and Nasdaq? If your broker can't talk you out of doing the trade, he or she may finally give in and agree to do it after all. But be skeptical of this sudden reversal. Brokers can sometimes attempt to purchase foreign securities for you through domestic market makers, in the U.S. over-the-counter (OTC) markets – sometimes known as the "pink sheets." And in the process, these brokers virtually guarantee that their clients will pay more for the stock than they would buying it in the local foreign market. Typically, these market makers, or "middle men," pocket up to 10% of the value of each transaction in the thinly traded OTC markets. In most cases, investors are not even aware of the extent to which their money winds up in the pocket of market makers. To purchase non-ADR foreign stocks efficiently means establishing relationships with traders who deal in the targeted foreign market. By executing orders directly on foreign exchanges, U.S. brokers can cut out the market maker and recapture the value otherwise lost to the middleman. Given the fact that developed foreign markets, as well as the emerging markets, continue to outperform U.S. stocks – and that the slide in the American economy and the U.S. dollar are gaining speed – the need to diversify investments outside of the dollar makes good sense. If nothing else, it gives you more choices in terms of stocks, nations and – by extension – more currencies to invest in. So it's important to shop around before making a decision. Unfortunately, most brokerage firms do not provide access to foreign stocks, while others restrict access to a few securities. Or, worse yet, they limit access to trading through domestic market makers on the pink sheets (in the way we explained above). The big, full-service brokers who have offices all over the world – Morgan Stanley, Smith Barney, Edward Jones, etc. – might seem to be in the best position to trade directly on foreign exchanges. Surprisingly, this may not be the case. Surprisingly, this may not be the case. All too frequently, full-service brokerage firms are not set up to handle foreign stock orders of small or even average size. SEC regulations regarding unregistered securities, related custody issues, and redundant stock symbols make foreign stock trading a cumbersome business for firms not specially set up to do it. Consequently, some of the big "houses" either won't take a small order or will take them and fill them as market makers, at high markups, which they are not required to disclose, at exchange rates that are exorbitant (and also hidden). Most of the online discount brokers – Ameritrade, Scottrade etc. – don't offer direct foreign stock trading services. In most cases with these online brokers, you'll be steered towards ADRs, which trade on U.S. stock exchanges, ETFs (exchange-traded funds), or closed-end mutual funds. If an online broker does offer the service of trading foreign stocks, it's generally a very small part of their business, and trading usually entails special restrictions or requirements. Before you go running off to find a broker to buy foreign stocks, definitely check with your existing broker to see if he or she can handle the business. However, remember that they don't want to lose your business, so they may tell you "Sure, no problem," when in fact they have no real concept of whether the trades can be effectively carried out or not. So you're going to need to ask some questions. The answers you get should clearly indicate whether you should stay or go. Can Your Broker Get the Job Done? Although a growing number of firms have begun offering foreign stock services, they might involve high minimum investment requirements, potentially limited market and security access, high commissions, and/or additional fees & costs. The easiest way to avoid a "bad" trade is to prevent it from happening in the first place. The following questions will let you know whether your broker knows what he's talking about and indicate the firm's capabilities. What exchange rate do I get? Currency conversion should cost you 10 to 15 basis points (a basis point is 0.01%), but you are apt to be charged 1% to 3%. That's a big difference, and unless you ask, you may never know you paid it. Can I be certain my order will be executed directly on the local foreign exchange, and not by a market maker in the U.S. using the pink sheets? Can I place limit orders (orders restricting execution to a specified price or better) in foreign currency? Can I elect to receive dividends as well as proceeds from sales directly in a foreign currency? Are there minimum transaction amounts, special fees for overseas orders, other hidden costs, or miscellaneous fees? Will you provide a list of all charges? Once you receive satisfactory answers to these questions, you're in business. If you receive unsatisfactory answers, it's time to go elsewhere. Fortunately, if you need to find a competent, trustworthy broker that specializes in foreign stocks, we've got some excellent suggestions. And please be assured. We have absolutely no financial interest in any of these recommendations. We're providing these purely as a service to our Money Map Report subscribers. For 25-plus years, International Assets Advisory LLC has championed the cause for globally diversifying a portfolio. The firm prides itself on doing independent analysis and works with clients who seek to enhance their returns and lower their portfolio risk through global diversification and proper asset allocation strategies. That's great news for clients. History demonstrates that a properly allocated portfolio can reduce risk, since markets around the world do not always rise and fall in tandem. To help their clients capitalize on the bullish global economic outlook, the IAA team has access to an array of international markets, stocks and bonds. And the firm has direct exposure to these markets, which means clients can buy international stocks not listed on the U.S. exchanges. But the scope of IAA is not limited to international investing. The firm operates as a full-service brokerage and money management boutique with expertise in the domestic markets as well. And for baby boomers, IAA has a retirement and estate planning division for their most demanding financial issues. IAA's sound asset allocation strategies – combined with a global approach to investing and financial planning – enable investors to capitalize on a wide array of opportunities. Interactive claims to provide "direct access trading worldwide at lower trading costs," and they certainly deliver. With Interactive Brokers you get direct access to options, futures, forex, stocks, and bonds in over 90 market centers worldwide from a single Universal Account. Commissions are clearly stated for each type of trade and/or market you want to trade in. This online broker offers straightforward stock trades, but has plenty of sophisticated trading strategies available for experienced investors. Through Schwab Global Investing Service, you can now access trading on more than 60 international stock exchanges in 35 countries. The Schwab team has extensive knowledge of non-U.S. markets. They are experts at handling the complexities of trading non-U.S. instruments. They also provide specialized help for your non-U.S. security orders. (Only orders of $5,000 or higher will be done directly on a foreign exchange). E*Trade offers trading in foreign equities in 24 countries and 42 foreign exchanges in U.S. dollars. It also offers online trading in six global markets, including Canada, France, Germany, Hong Kong, Japan, and the U.K., while allowing customers to diversify amongst five currencies in order to manage exchange-rate risk and hedge U.S. dollar exposure. EverBank is not your typical bank. It's an innovator in electronic global banking, providing clients with opportunities for capital appreciation across an array of financial markets. Everbank offers all the personal deposit accounts you'd expect from a "normal" bank – like checking, money market, and CDs – but it also offers a wide range of investment services in foreign currencies. Everything from executing your stock trades on foreign stock exchanges, access to high-quality foreign bonds, or even speculating on currencies and metals. Want to capitalize from your bearish outlook on the U.S. dollar but don't want to buy foreign stocks or bonds? EverBank allows individuals to benefit from global currency investing by offering FDIC-insured WorldCurrency deposits in many of the worlds major currencies. They are currently the only bank in the nation to do so. You can open a Single Currency CD in one of more than 15 offered foreign currencies and earn an interest at local rates. Or select from their Multi-Currency CDs, a single CD comprised of multiple currencies – each strategically designed to focus on a specific regional strength, and/or geopolitical and economic development. And if you turn bullish on the dollar, that's fine, too. EverBank recently introduced its newest currency investment product, DollarBull CDs. There is always the option of directly opening a foreign bank account. This will involve some extra effort on your part, but the added privacy and security benefits may be important enough to justify the effort. The following offshore banks have access to multiple foreign stock markets, as well as offering conventional banking services. This Copenhagen-based bank offers a wide range of products and services for the international diversification of assets. It specializes in providing the best financial advice and highly individualized service; you will be assigned your own personal investment adviser. This Zurich-based asset management firm offers independent asset management for globally diversified portfolios. It provides personal, customized, and comprehensive international financial consulting and asset management for both private and institutional investors. Member of the Swiss Association of Asset Managers (SAAM). Weber, Hartmann, Vrijhof, & Partners Ltd.
One of Switzerland's leading bank institutions, Bank Julius Baer manages substantial assets for private and institutional clients globally. Services include: asset management and investment counseling, investment funds for private and institutional investors, institutional brokerage, and securities and foreign exchange trading. For those looking to diversify their assets globally, there are many paths available, and ASI can help you negotiate them. For the past 25 years, ASI's principals have worked to develop relationships with the highest-quality financial service organizations throughout the world on behalf of their clients. Owners Michael Checkan and Rich Checkan are precious metals and foreign currency specialists who act as dealers in four precious metals and 120 different foreign currencies. ASI buys and sells gold, silver, platinum, and palladium in the form of coins, bars, and certificates. It also brokers currencies throughout the world, like the euro, Japanese yen, Swiss franc, and Australian dollar. Although ASI cannot establish offshore structures or corporations for you, it can refer you to some extremely qualified individuals for these specialized services. Once the structure is established, ASI provides a global money transfer service to convert your U.S. dollars into foreign currencies and transfer the proceeds abroad. Please Note: From time to time, Money Map Press will recommend stock investments that will not be included in our portfolios. There are certain situations where we feel a company may be an extraordinary value but may not necessarily fit within the selection guidelines of these existing portfolios. In these cases, the recommendations are to be considered as speculative and should not be considered as part of Money Map Press philosophy. Also, by the time you receive this report, there is a chance that we may have exited a recommendation previously included in our portfolio. Occasionally, this happens because we use a disciplined selling strategy with our investments, meaning that if a company's share price starts to fall too much, we immediately notify our subscribers to sell the stock. NOTE: Money Map Press is not a broker, dealer or licensed investment advisor. No person listed here should be considered as permitted to engage in rendering personalized investment, legal or other professional advice as an agent of Money Map Press. Money Map Press does not receive any compensation for these services. Additionally, any individual services rendered to subscribers by those mentioned are considered completely separate from and outside the scope of services offered by Money Map Press. Therefore if you choose to contact anyone listed here, such contact, as well as, any resulting relationship, is strictly between you and the Pillar One service.